The first half of the twentieth century saw a huge number of weekly and monthly story magazines; “pulps” as they became known. They were a major part of popular culture until television killed them off in the sixties. Westerns, science fiction, romances, mysteries and adventure stories all appeared and authors who could spin a captivating yarn, keeping the readers buying issue after issue, were a valuable commodity. C.S. Forester was one of these authors, particularly with the success of The Happy Return (Beat to Quarters) after which Hornblower became saleable in serial form. Here’s the cover of the first of six instalments of Ship of the Line appearing less than a year after Hornblower’s debut in the US. Forester often had top billing on the front cover, especially for new stories. Forester’s success allowed Hornblower to eventually graduate to the more up-market “slick” publications. The Saturday Evening Post and John Bull (later relaunched as Today, the New John Bull, replete with girlie magazine covers and racy features) are fascinating reminders of the world of more than half a century ago. WWII and Cold War commentary, ads for tobacco, medicines, cars and the new products of the day are wonderful reminders of the social and family values of the times. I was often diverted from Hornblower and captivated by the surrounding material. In The Hornblower Companion (chapter 29) Forester himself notes how ground-breaking was the adultery of Commodore Hornblower appearing in the Post in 1945. When you look through the whole of those issues you gain a better understanding of why this was so. So how did I come to discover the Hornblower pulps? Hornblower and the Crisis is published with Hornblower and the Widow McCool and The Last Encounter, and this revealed to me the existence of Hornblower short stories. Quickly I was led to Hornblower One More Time which collects the other three and which is available online at http://www.scaryfangirl.com/Once%20Again5thNetVer.pdf. The stories are attributed to their original pulps with a note that revealed that slightly different versions had been published in the UK. Now I was hooked and searched the Internet for details of Forester’s works in pulps. Fortunately most of the work had been done for me on William G. Contento’s web site at http://www.philsp.com/homeville/FMI/0start.htm. I could see not only where the five Hornblower short stories had been published but I also found details of the serialisations of the eleven novels. This turned out to be just about the limit of my discoveries online. A few scans can be discovered here and there but I realised that buying my own copies of these vintage pulps was going to be the best way to see that material. This was something of a daunting task with 132 issues to find; 54 from the UK and 78 from the US. Fortunately there’s a thriving market for vintage pulps, particularly in the US. The same vendors I had used to acquire old editions of the Hornblower books also carried many old magazine issues. The main sources are probably no surprise to book lovers on the Internet: AbeBooks.com, Biblio.com and eBay. There’s substantial but not complete overlap between the first two of these as many book sellers use both services. One of the biggest frustrations was the existence of separate Argosy magazines in the US and the UK, both of them publishing Forester stories. Then there’s the varying format of dates in use so that I was forced to search by year only and manually check through the results. One bonus is that all three sites have a facility to automatically send email when new items match a search. It’s necessary to be enterprising with eBay as it tries hard to hide listings where the seller doesn’t offer to ship to your country. Actually most sellers will ship to other countries when asked so I ended up setting up extra eBay accounts in the US and the UK (I live in Australia) just to send me notice of local listings. The actual purchasing was done with my local eBay account once I’d confirmed shipping was possible. At the outset, with a large number of items sought, it pays to search for big sellers who have multiple items available to save on postage. Searching for issues of interest quickly reveals the vendors with large catalogues of magazines and I was able to tick off a dozen or more items in a single purchase more than once. There are a few vendors with their own web sites. I found http://www.tilleysvintagemagazines.com, http://www.vinmagarchive.com and www.advertisingarchives.co.uk to be good sources for John Bull and http://www.abookman.com/ has quite a comprehensive stock of Saturday Evening Post. Some book chapters are missing from the serialisations. It’s possible that they were published in issues that I’m not aware of and I’d be very interested to hear of these. I don’t know of any serialisation in the UK of the first five novels, up to Lord Hornblower, nor of Hornblower and the Crisis. If these novels were serialised perhaps it was in newspapers or in some other place that’s not well indexed on the Internet. The only exception is that an excerpt from The Happy Return was published in the May 1949 Argosy (UK) as The Lydia and the Natividad, in the middle of their serialisation of Mr. Midshipman Hornblower. Both the Argosy (UK) and The Saturday Evening Post in the US omitted a chapter, The Man Who Saw God, from that book. Later, The Guns of Carabobo was omitted from Admiral Hornblower in the West Indies in the US though it was printed in John Bull in the UK. 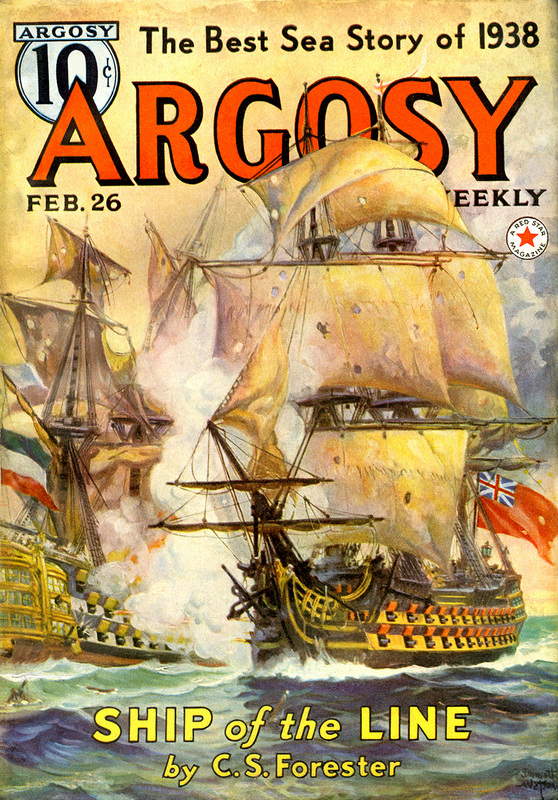 Finally, Hornblower and the Hotspur appeared only in very abbreviated form in US magazines in a single issue of Argosy (US). I find some interest in the way the final chapters of Lieutenant Hornblower are given a separate title in serialisation: High Stakes Mr Hornblower in the US and Hornblower the Gambler in the UK. The long gap in the action and some problems with the chronology are further hints that these chapters were written substantially later. Similarly, in the UK the first part of Hornblower and the Atropos is published under the separate title Hornblower and the Nelson Touch. None of the issues seem to be especially expensive on account of their Forester content but some are priced at a premium for other reasons. The last instalment of Ship of the Line in Argosy (US) shares its pages with the first instalment of a new Edgar Rice Burroughs science fiction novel The Synthetic Men of Mars. So too The Saturday Evening Post’s front page was famously often illustrated by Norman Rockwell so Hornblower stories inside some sought-after covers come at a higher cost. Still, patience and careful searching has paid off and my US collection is now complete. The UK seems to be harder with a much smaller range of old magazines for sale. Unsurprisingly the oldest issues are the most problematic with the 1940s Argosy (UK) scarce and John Bull from the early 1950s not much better. I still lack four issues in all. What if patience runs out? To work around the problem of the missing issues I resorted to inter-library document delivery services to fill in the final gaps in my collection. This is not a money-saving option! The cost of obtaining a dozen or so pages of Hornblower content is often more than that of buying a whole vintage issue. The services are more attuned to scientific journals than to popular periodicals and sometimes had difficulty dealing with stories heavily interspersed with advertising and often continued on the back pages. But with some effort I now have the complete text of Hornblower as originally serialised. Below is a table listing all the Hornblower first editions that I’m aware of both in book and serialised form published in the UK and the US. Note : you will need a PDF reader .